Although competition is already fierce among animated and 3D films this year, they'll all make room for this, the quirkiest entry yet. Despicable Me is a rousingly funny, heartfelt and imaginative ‘toon blessed with the vocal talents of Steve Carell and loaded with whimsy and smarts. 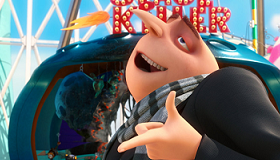 Centered on the bizarre world of Gru, a "super villain" whose plans to pull off the biggest heist of all time are complicated when three orphaned girls come into his life, this thoroughly entertaining confection may not give Toy Story 3 a run for its money but is hilarious, wacky, twisted fun by any measure. After a rough couple of years with few bright spots, Universal should find significant theatrical success for the relatively bargain priced $65 million production once word of mouth surfaces. Prospects down the road on DVD would appear stratospheric. Despicable Me represents the inaugural entry for Universal into the field of 3D CGI. From the former Fox ‘toon wizard Chris Meladandri (Ice Age, Horton Hears A Who) and his Illumination Entertainment, this features the best use of 3D in any animated feature yet, in part because it's careful to keep the gimmicks secondary to its first-rate storytelling. Gru (Carell), assisted by resident mad scientist Dr. Nefario (Russell Brand), lives in a world populated by his ‘minions,' little yellow creatures who do all his dirty work while he spends his days in a mansion filled with Bond-like gadgets and inventions. His plan is to pull off the biggest theft all time. He wants to steal the moon! But to do that he needs all the help he can get, which he finds in three orphan girls who come to sell him cookies. These three have managed to crack the impenetrable wall of his main nemesis, Vector (Jason Segel), a geeky dude who fires live piranhas from guns and possesses a shrink ray device central to Gru's plans to grab the moon and bring it back to earth. Posing as a would-be-father, Gru convinces stern Orphanage head Miss Hattie (Kristen Wiig) to let him adopt the three adorable homeless girls, Edith (Dana Gaier), Agnes (Elsie Fisher) and Margo (Miranda Cosgrove), who are able to lead him to his nirvana, or so he thinks. When the realities of being a Dad, no matter how bad a dad, begin to raise their ugly heads, this villain finds he may have a heart. Carell, adopting a slightly Russian accent and a maleficent stance is just terrific voicing Gru. He makes this goofy master of evil work even when there's not a whole lot to like about him. It's a clear gamble for directors Chris Renaud and Pierre Coffin, and screenwriters Cinco Paul and Ken Daurio (from a story by Sergio Pablos) to center a mainstream ‘toon around a villain but the bait and switch works beautifully in the hands of the clever Carell, who runs with the character and scores. Segel is the perfect adversary and the numerous minions (largely voiced by the directors) are a delight to watch, as well as a merchandising home run. Julie Andrews also turns up for a few laughs as Gru's mom while the rest of the cast is perfection with special huzzahs for the three girls, Gaier, Fisher and Cosgrove, who are sweet without being cloying. Although it seems a requirement to release animation in 3D these days many of the films don't really need it, but this one makes sprightly good use of the technology, particularly in a wild amusement park outing and at the end credits where the playful minions try to "climb" into the audience. Once that audience finds Despicable Me they will discover it is likely impossible to have a better time at the movies this summer. Rating: PG for rude humor and mild action.